The G3 Standard Yacht offers its guests a welcoming environment. 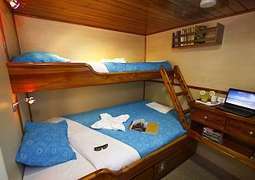 You have the choice of booking a cabin in either the upper or lower deck. On board the G3 Standard Yacht, a delicious breakfast, lunch, and dinner will be served.